These four new awards for Mexico’s Pacific Treasure complete a total of 12 HSMAI Adrian Awards garnered over the past nine years: three gold, four silver, and five bronze. The Riviera Nayarit has won four HSMAI Adrian Awards 2018 (1 gold, 1 silver, and 2 bronze), a prestigious recognition that rewards best practices inspired by Advertising, Public Relations, and Marketing in the hospitality industry. These awards, considered the “Oscars” of these segments, were given to the Riviera Nayarit Convention and Visitors Bureau (CVB) by the Hospitality Sales & Marketing Association International (HSMAI) via its public relations agency in North America, Finn Partners, thanks to four articles inspired by this tourism destination that were published in top media in the United States and Canada. With these four new awards the Destination has a total of 12 HSMAI Adrian Awards garnered over the past 9 years (the first was win 2009): three gold, four silver, and five bronze, all in the category of Public Relations. The reception and gala award ceremony took place last February 20, 2018, at the Marriott Marquis in New York City, where the best of the best of the tourism industry gathered for the night. 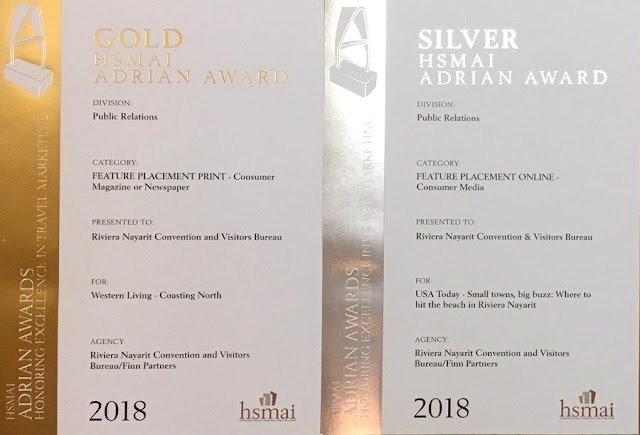 The Gold HSMAI Adrian Award was received for the article “Coasting North,” published in Vancouver’s Western Living magazine and written by Anicka Quin. She captures the essence of the Riviera Nayarit across nine pages, including the Punta Mita “peninsula” and its luxury resorts, and the traditional coastal villages of Sayulita, the Capital of Surf; San Pancho; Bucerías; and La Cruz de Huanacaxtle. The silver was awarded for “Small towns, big buzz: Where to hit the beach in Riviera Nayarit,” published in the online edition of USA Today, one of the most prestigious dailies in the United States. The article was written by Mark Rogers, who with its writing reaffirmed his commitment with the destination after his last visit in July of 2017. One of the Bronze HSMAI Adrian Awards was given to the Rivera Nayarit travel guide published in “A Taste of Koko,” the top food and travel blog from Austin, Texas, which included the best restaurants and weekend getaways. The second bronze was awarded for an article published in the Egde Media Network portal directed at the LGBT market and written by Matthew Walker. “There’s no doubt the Riviera Nayarit is an inspiration for top writers to produce ‘masterpieces’ that at the end of the day translate into important awards like the HSMAI Adrian. This speaks to the excellent job being done by the Riviera Nayarit CVB, the Bahía de Banderas Hotel and Motel Association, and the partnership with Finn Partners,” said Marc Murphy, Managing Director of the Riviera Nayarit CVB. 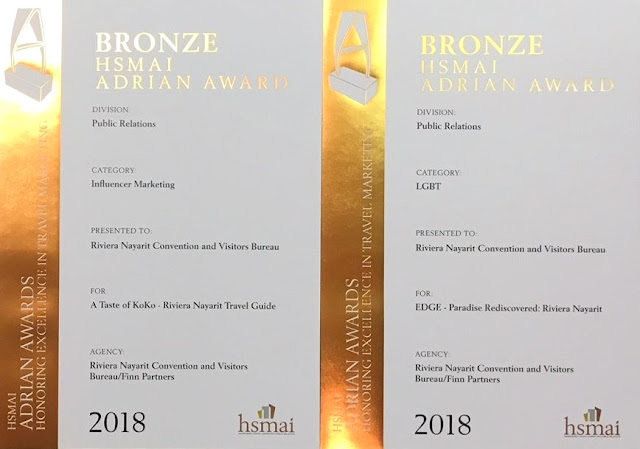 The HSMAI Adrian Awards celebrate lifetime achievements in advertising, public relations, and digital marketing, as well as the teams that make it all possible. The awards are celebrating their 61st year, which speaks to its credibility and importance. Winners are selected by top industry experts from among more than 1,200 particpants from around the world, of which less than a third can boast of having obtained a gold one. The Riviera Nayarit Convention and Visitors Bureau (CVB) and the Bahía de Banderas Hotel and Motel Association (AHMBB) continue to their joint promotion of the region, helping to position Mexico’s Pacific Treasure on the global map, together with the support of the Government of the State of Nayarit via the Tourism Promotion Trust (Fiprotur).